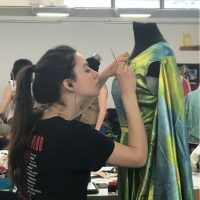 Over my studies, I have utilised the opportunity to explore my imagination and build on my skills as a costume designer. I am not only passionate about costume, but also about narrative and storytelling. I find the concept of building a character exciting and full of endless opportunities. I tend to challenge myself in my work and explore various directions of inspiration. There isn’t a consistent drawing style within my portfolio, however I am particularly inspired by colour and pattern. These elements feature heavily in my designs and I enjoy experimenting with dyeing and printing techniques during construction processes. Due to my background in contemporary dance, I am passionate about designing for movement and enjoy challenging myself with new inspirations that will help support the narrative behind the choreography.